A new state rule says all bus fleets need to be emission-free by 2040. In San Diego, transitioning the fleet of 500 MTS buses is already underway. But completing it could cost hundreds of millions of dollars. SAN DIEGO, Calif. (KGTV) - A new rule from the California Air Resources Board could wind up costing San Diego MTS hundreds of millions of dollars. CARB announced a series of regulations last week , all aimed at making bus fleets more environmentally friendly. One rule says all buses need to be zero-emission by 2040. Right now, SDMTS uses Compressed Natural Gas in their buses, which they say burns much cleaner than diesel fuel. Those buses cost $557,000 each, and MTS buys about 50 new buses each year. New electric, zero-emission buses will cost about $912,000 each. Replacing the entire fleet with electric buses will cost $177.5 million more than CNG buses. "The technology is relatively new, the costs are high right now," says MTS Spokesperson Rob Schupp. "I think CARB is looking into the future. As we encourage more and more manufacturers to build these buses, the costs will come down." San Diego MTS is already putting six electric buses in their fleet this summer as part of a pilot program. They'll use those to test how the electric buses operate across several terrains and distances in San Diego. They also received a grant to help buy 11 more for a South Bay Bus Rapid Transit line that will open in 3 years. 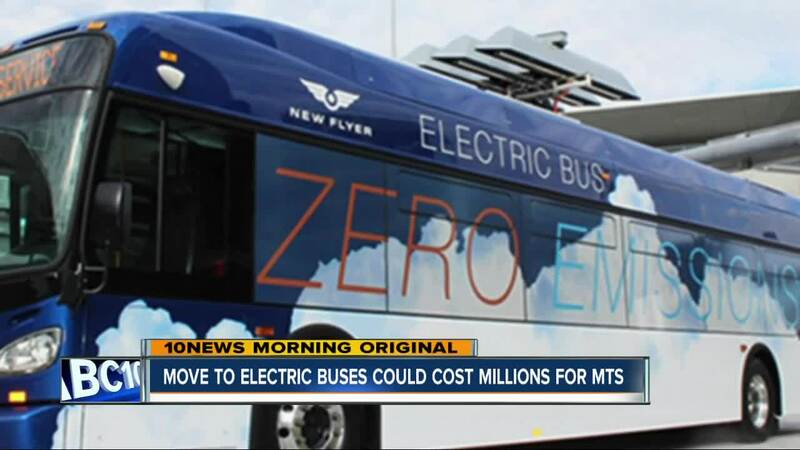 Beyond that, MTS says they may use a combination of state funding, grants and possibly rate increases to pay for the new electric buses. Schupp says the state has plans to chip in about $150,000 per bus. The cost of new buses isn't the only concern about going electric. MTS says they need to look into how much electricity will cost compared to natural gas. They also may need to build and install charging stations around town, because the buses may not be able to go as far as they would using gas. Despite all that, Schupp says the MTS Board fully supports the change.